Nobody says ‘I do’ thinking that their marriage won't last. However, it is a sad fact that a large number of marriages do fail, with current figures somewhere between 30 and 40 per cent. When couples decide to divorce, there can often be bitter wrangling over the financial and proprietary aspects of the marriage. Generally, if one person has control over the finances during the marriage, the other party will be at a considerable disadvantage when it comes to the divorce proceedings. Every marriage concerns an element of interdependence but when a couple divorces there is a need to divide assets, money and other property. However, these are broadly divided into two categories, ‘marital’ and ‘non-marital’ assets. What Are Marital and Non-Marital Assets? 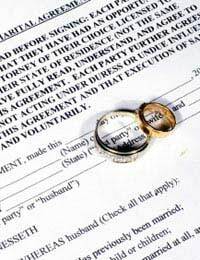 If you have assets that you owned before the marriage, such as money or property that you have inherited, payouts from personal injury awards or other legal settlements, or gifts that you receive during the marriage that were not intended as ‘family’ gifts, these are non-marital assets. For example, you as an individual inherit a painting that you then sell at auction. If you deposit the proceeds into a joint bank account, or spend some or all of the money on your spouse or joint assets, this property then becomes marital property. There are ways to identify and track liquidated non-marital assets, but these procedures are seldom straightforward. In order to protect your non-marital assets from being counted as marital, always remember to keep them separate. If you are not yet married, consider talking to your future spouse about the assets that you both have and what you both intend to keep as your own. Although it’s not exactly romantic, it can help to avoid considerable emotional wrangling and bitterness in the future if the marriage fails. Keeping your own assets separate in a marriage is particularly important if you are at a financial disadvantage, e.g. if you are not working, are working but earn considerably less than your spouse, or if you are at home caring for children. Some spouses, usually wives, can rely solely on their husband’s means all their married lives and when it comes to divorce they can discover that they are barely credit worthy. As a result it is vitally important that you retain a good credit rating, so that if you find yourself single again you are able to support yourself and obtain credit from lending institutions. The easiest way to do this is to have a credit card in your sole name. However, it is equally important to maintain your payments on this account, as a bad credit rating is as bad, if not worse, than having no credit history at all. Also, make sure that you are named on all the household accounts. Finally, if you are on the brink of divorcing your spouse, make sure that you close any joint accounts immediately. The last thing you want is to be subsidising your spouse (and perhaps directly or indirectly their legal fees) after you have separated. DIY Divorce: Is it Right for You? Hi I've got married 9 years ago and now getting divorce with my husband. During our marriage I have managed to acquired a property on my own and titled solely on my name. Will my husband get a share from it? How can I make sure that he won't be able to put his hands on it? Hi, Have been in a relationship for 13 years but not married and no children. We did own a house together although have sold this and about £90k sits in a savings account. Other assets are all cash, I have about £120k savings where as my partner has approx £30k. I have no intention on leaving my partner although want to understand my legal position if I were to. I think if anything where to happen we would simply split the £90k from the house sale equally and that would be that. However, the problem is more likely come from my partner's family...both her mum and two of her half-brothers have, in the past, suggested that my savings are also my partners and that we are common-law husband and wife. I believe their interest is that my partner's father died a few years ago and essentially left his half of the house to his two children in trust (whilst the mother lives there). I would never dream of trying to incorporate their family home into any separation although feel that if my partner was to try and claim any ownership over my savings then I would have an even stronger (at least moral) argument to having a share of what she has essentially inherited in trust (because of how I have helped care for her father and mother for years whilst their own children have been completely absent). Can you please help with some advice, pointers, further reading etc? Without elaborating any further, our relationship has almost broken down recently because of her families actions. I have been married for 13 years, bought a house which I’ve rented since bought and never lived in it alone or with my wife/family. I wanted to know if my wife has ANY claim to it if we were to divorce. ? My daughter and her fiancé have just had a baby. They have agreed that she will be a stay at home mother. They currently rent a property. Her fiancé earns a very good salary and and is buying a large property which will be the family home. He does not wish to put her on the title deeds as he is financing it entirely by himself and wishes to protect his investment.My daughter will not be contributing financially as she will not be earning. They each have a (mortgaged and rented) property in their own names acquired prior to their relationship. Assuming they get married does my daughter have any financial interest in the family home or right of occupation, should the marriage fail? My wife and I are divorcing after 4 years of marriage but 15 years together with two children.We have a joint property which will be sold and divided.I have a property which I purchased 20 years ago before I met her.This has a mortgage and was also remortgaged to purchase the joint property.Will I have to sell and divide the assets in my sole property.She is wanting half share of this.I am paying over the maintenance amount for my children who I have three days a week. My sole property is rented and with good tenants. We were married couples lived in a house .owned by me .bought recently . Now we separated.Is he got any type of rights in this property . I got married overseas, in Dec 2017? @, less than a year. In a scenario if a divorce now, can my wife claim % of my flat (bought in 2012) and my car (bought before marriage last year). Both fully maintained by my finances coming out of my bank account. She is trying to get the council tax in her name as she has started a masters for the student discount but everything else is born by me. Any implications on my car and flat? Hi. I used to own my own home. I sold it and used the proceeds so me and my wife could buy a house together. I paid a deposit of 18k and she paid nothing. 17 months after getting married and moving in together, she moved out. I paid a 4k penalty to remortgage the house in my name only. She inherited 40k the day she left... If / when we divorce, would she be entitled to anything? I have no savings. I've only just paid off the wedding! We have already divided furniture etc. We never had a joint account. Thanks for your help. My daughter has recently separated after less than a year married and her husband is in the process of buying her out of their house There are no children. There are a number of items of expensive pieces of furniture which my daughter is paying for via credit agreements in her name.She has still over three years of payments to make. She has asked for the items but been told no. Can she just go in and remove those items from the house since she has proof of ownership via the credit agreements. I live with my husband and son who have joint mortgage of the house l am in deep financial trouble which l can not get out of l am thinking of bankruptcy have l any asset. I have a few properties that I purchased before I got married. I have child with her now, If I was to get a divorce would my assets still stay mine or does she get a percentage? Your wife (if she is the primary carer of your child) is likely to get a percentage, as the court will put the child first in any financial settlement. I have a few properties that I purchased before I got married. I have child with her now, If I was to get a divorce would my assets still stay mine or does she get a percentage?. Hi my dad bought a home with his wife in 2000. They divorced about 6 years ago and he signed something not realising that the house is now solely in her name. He thought it was a paper to sell the house. Is there anything he can do about it? He doesn't pay the mortgage anymore. Your father would have to seek legal advice regarding this matter as it would have to be referred to court if his ex wife is not in agreement. Given the marriage was short, it is highly unlikely your husband can make a successful claim if the mortgage is in your name and you owned the house previously for a good length of time. The property will be considered marital given the length of your marriage. Much will also depend upon the amount of money you put into the property pre-marriage and whether you have children or not. @Vampi -Only if your ex objects or attempts to challenge this might there be an issue. I got divorced in 2016 and live in my house which I have owned solely for 13yrs before I got married.Its in my name and so is the mortgage and always has been. There was never a financial settlement made when we divorced due to a negligent solicitor.The marriage only lasted 2 years.He has his own assets and also thieved 28K from our joint bank acc which I have never claimed.He has never claimed from me either. I'm now planning to move house and my solicitor sent me a client form.It is asking me if I married since purchasing my property.I have plus got divorced. In the absence of an agreement, will this prevent my solicitor and me from selling my home now? I dont want it all dragged up again.So I guess I'm asking if this will prevent me selling my home? I am seeking some advice. I married 3 years ago and didn’t protect my own assets - house £250,000, savings, good pension etc. I am now considering separation but can my husband claim 50% of my assets. He entered the partnership with nothing and has not paid mortgage etc. My name is on everything and i have paid everything. The only thing he has given is the odd £100 to ‘help’ with food and socialising. Hi my partner is still married to his ex but they have been separated for 4 years now. The house that they bought together (which he paid the deposit for and some of the bills) has now been put up for sale. The house was signed in her name due to him being self employed at the time. Where does he stand? Can he get his deposit back and also can he get his share of the interest of the house from martial interest? At least £10,000 of the deposit was a gift from his family (mother and father) he has all receipts and statements to prove where the money came from and where it went to and also receipts of bills that he paid during and after the time he was living there. The house has been put up for sale without notifying him first. Any help please? We have also rang the solicitors to start the ball rolling for divorce but would like as much information as possible to help us to get his money back for his family... and any marital interest is a bonus! @Elou - I wouldn't worry. What's he going to do, take you to you court! You have every right to get rid of the stuff, absolutely. Re: What to Do with the Family Home? does it matter if its not equal when dividing up assets if we are both in agreement on how we divide the assets?